My first official album review will be for the mini album that marks the reunion of Micheal Kiske (ex-Helloween) and Kia Hansen (ex- Helloween, Gamma Ray), Unisonic's Ignition. In January this mini album came as a taste of what's to come later this month, and certainly delivers what can be expected: the classic Helloween feel from the Keeper of the Seven Keys era with lots of energy. The album's opener, Unisonic, sets the tempo as a fast-paced rocker that sounds like it could be a chart topper in the 1980s. The energy in this track is enough to raise the dead, or at least turn an average or terrible album into a solid one. The next track, Sanctuary, continues with the radio-friendly hard rock approach and, just like the previous track, this one does not disappoint. The third track, Souls Alive (Demo Version), is the heaviest of the album and, although it has the least catchy chorus of all the songs, is by far the strongest song on this album. The lead guitar is more melodic than the other tracks and still has a classic heavy metal feel to it. The clean section in the song acts as a great break that helps to build up to a beautiful solo and eventually the chorus. The album ends with the live version of the classic I Want Out and, ignoring the voice crack and the fact that it seemed to have taken a bit for Kiske to get warmed up, the song sounded better than it has in years. For that matter, even with all that it still sounds great again. 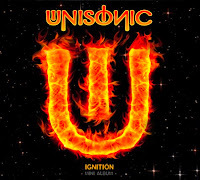 All in all, Unisonic's Ignition is a solid listen that you will be singing along to after a couple listens, and definitely a cd that you'd want to have turned up to 11 while driving. The only thing that might keep anyone from enjoying it is if they don't enjoy Kiske's vocals. Other than that, it is a must listen for fans of Helloween, Gamma Ray, classic heavy metal and hard rock: 8.5/10.